I tried changing my Will Ospreay over Lance Archer pick to Archer winning, only I apparently didn't save it properly. So I ended up with the prediction that turned out to be correct only through a fluke. If you listen closely to Wrestling Observer Radio, sometimes you can pick up hints. 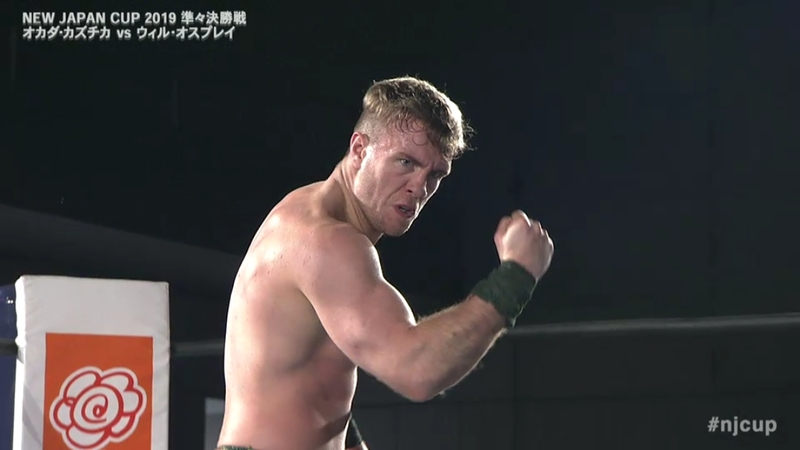 Dave said Beretta had been in line for a good push in NJPW before opting instead to sign with AEW. Dave also said that Colt Cabana had impressed NJPW officials. It made sense to me that Cabana likely took Beretta's place in the tournament, and sure enough it appears that's what happened. It was Omega who said the original plan was Omega dropping the IWGP Heavyweight Title to Kazuchika Okada at the ROH/NJPW G1 Supercard show at Madison Square Garden in New York City, taking place the night before WrestleMania 35 over in New Jersey. The winner of the Cup gets a title shot in the main event of that show. Normally I have a tough time figuring out what NJPW's booker, Gedo, is going to do; it can be like trying to solve a Sudoku puzzle on master difficulty level. But in this case, with more clues than normal, I've been able to predict it rather closely up to this point. 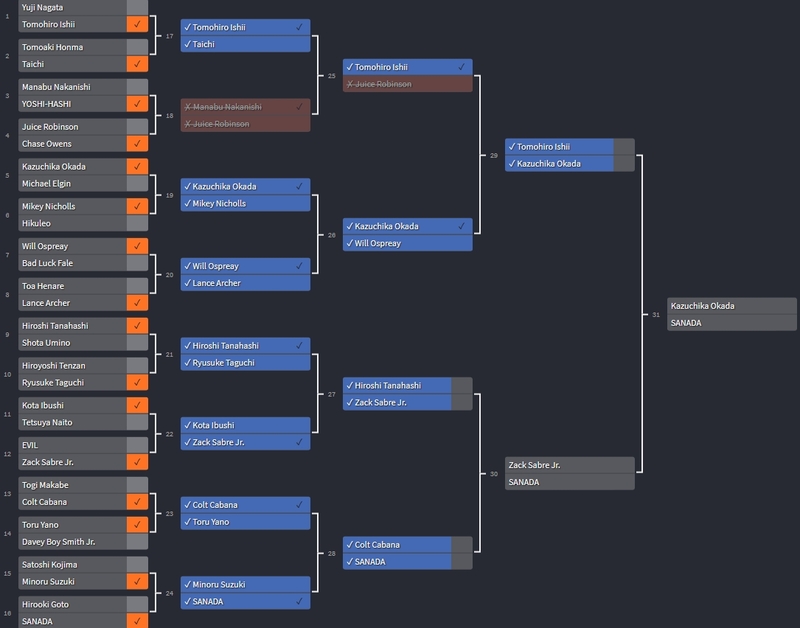 Here's my tournament tree; I have Okada over SANADA in the 2019 New Japan Cup final. If I win out, I will finish first in the pick 'em. It has been strongly hinted that Tomohiro Ishii will be involved in an important match at MSG. Seems entirely likely that Ishii will lose to Okada in the semifinal, then Ishii can challenge Juice for the U.S. Title at MSG after Juice (presumably) beats Chase Owens the night of the New Japan Cup final. Here's the card for New Japan Pro-Wrestling's upcoming Hamamatsu show, beginning in a few hours from the time I'm writing this. 4. Michael Elgin & Ryusuke Taguchi & Toa Henare vs. Minoru Suzuki & Lance Archer & Davey Boy Smith Jr.
8. 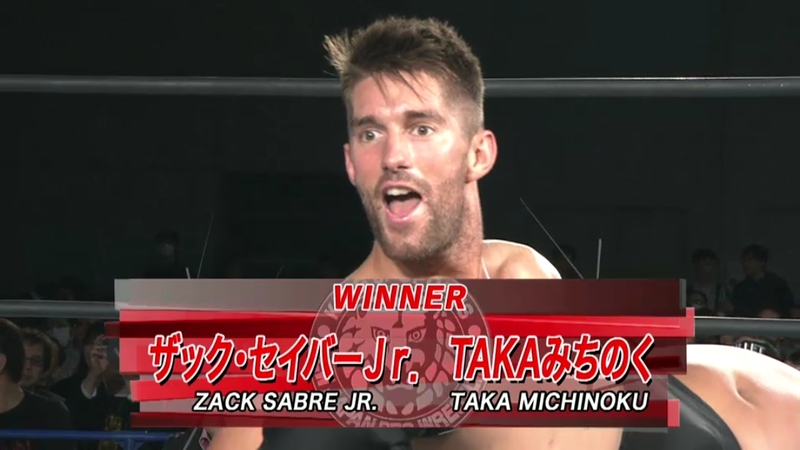 Hiroshi Tanahashi vs. Zack Sabre Jr.
Great call on the English feed by Kevin Kelly and Excalibur on the last show from Twin Messe Shizuoka. Normally I would complain about a color commentator taking control of the play-by-play call at times, but Excalibur is so good that it works, plus Kevin can work with almost anyone on color. Almost more like Jim Ross/Tony Schiavone 1991 WCW, and I mean that as a compliment. It also makes me wonder if it might be something similar with Alex Marvez and Excalibur and the mystery third person in the AEW broadcast booth. I know that if I were to ever do play-by-play for a pro wrestling match, I would want someone like Excalibur in there on color to help fill in the blanks. Only downer with the duo was not having anyone for translations, but considering how bad it was even two years ago (solo-cam with nat sound only) for the New Japan Cup spot shows, this is a vast improvement and I can hardly complain about not having a translator. And I will almost always take a two-man booth over three, unless the third is a translator who only speaks when doing the translations. Like that Django guy who did translations for awhile on the English feed. I liked the bracket talk on English commentary, and while likely unintentional, the timing with that is great with the NCAA men's basketball tournament being such a big thing in the United States this week. Okada vs. Ospreay definitely felt like they were holding back for another time, yet what they did was intriguing with the counters. Tease the big moves for another time and a much larger venue. And, to their credit, they didn't have to burn an Ospreay finisher kickout to have an entertaining and (relatively) safe match. It has been quite the tournament for Ishii: tearing down the house against 50-year-old Yuji Nagata in a ****1/2 thriller, getting a four-star match out of Taichi, and then having a really good match against Yoshi-Hashi. Ishii is 43 years old and still going strong. And I can't wait for Okada vs. Ishii. Yoshi finally has gear that isn't fraying mid-match, and this was definitely the best look I've seen from Yoshi to date. The red-and-black mouthguard works well for him. 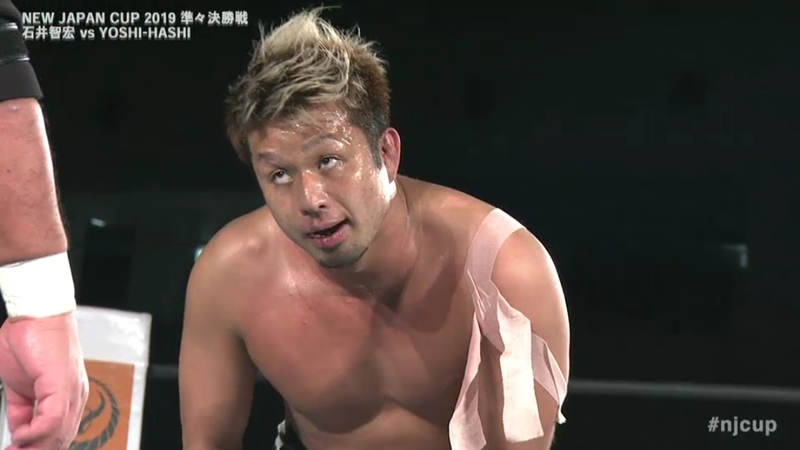 There were some fun facial reactions on the show, including Yoshi-Hashi about as fierce as he will ever look. 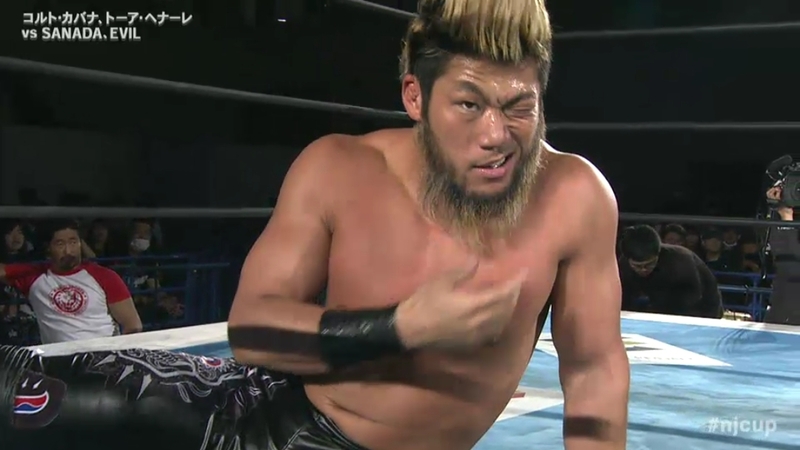 Also, it appears that Seiya Sanada is slowly morphing into a lion. If Tanahashi and Sanada both win, they would have their first singles match since 2016 (and only their third ever) with almost no build and possibly being relegated to the semi-main slot behind Okada vs. Ishii. Would seem that NJPW would be much better served to save Tanahashi vs. Sanada for the G1 or another major show on down the line. And the maximum value for the rub of breaking Sabre's Cup unbeaten streak would be Sanada in the semifinals. Tanahashi wouldn't particularly gain much from breaking it (he has been in the Wrestling Observer Hall of Fame since 2013, after all) and Sabre losing in the finals would be overshadowed by the winner getting to main event MSG against Jay White. Especially if it's Okada winning, as expected. Sanada has been at that mid-major level for awhile now. He turned 31 two months ago, and clearly there is potential to elevate him. Beating Goto, Minoru, Cabana, and then Sabre to break the streak would be a rather impressive road to the finals for Sanada. Except where otherwise noted, all content on this website is copyright � 2017-2019 Lou Pickney, all rights reserved. The views expressed on this website are mine alone and do not necessarily reflect those of any media company. This website is not affiliated with New Japan Pro-Wrestling or New Japan World.